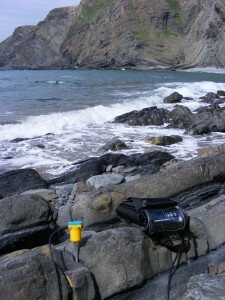 I drove down to North Devon to Hartland Point with a friend Charlotte, to see a seismometer in action. I wanted to find out what I was hearing with the microphones I had put in the ground in Bristol? (Piezo and AKG pick-ups and a geophone). What was I hearing from them? How could I find out where the sound was coming from? The understanding of this long distance low frequency microphone would help me find out. I was right about seismometers picking up sound waves traveling long distances from other continents, which was mind blowing, but surprisingly even thelocal dog walkers had an effect on the seismometer. This was strange, but of course they were making their own mini tremors with their foot -falls. 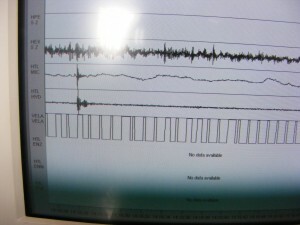 I stamped my foot and the seismometer reacted instantly even though it was out side the building 60 METERS AWAY!! 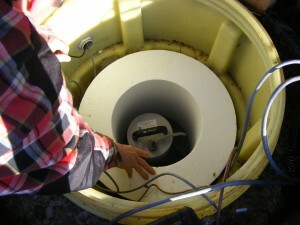 This clever instrument could pick up the quieter range of sounds in the ground. It would be capable of monitoring 0.01Hz-100Hz, and the (inaudible to human ear –which hears from approx 20Hz) natural Hum of the earth (0.02Hz- 7 Hz). And this being lower than the cultural man made sounds from cities and trains (in particular) that start at approximately 1Hz. 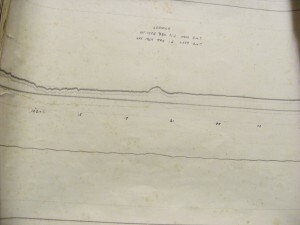 While I was getting my head round the image of a sound wave making it’s way to effect this instrument, in a box 6 foot under the ground, from several thousands of miles away, I felt the mighty physicality of the sound wave traveling over such a distance was certainly a planetary scale event. I start to think of earth as a lump of humming, quaking, vibrating buzzing rock. The work by artist Floriain Dombois, puts this global phenomena into context with pictures of measuring devices in sheds and compounds and seismic stations from different 60 countries. (Seismic Stations Global seismographic Network (GSN) 59 of them. Up in the Edinburgh the British Geological Society monitor the signals that get picked up from round the UK, those from the UK and those that have traveled from other continents. With data from different station’s the origin of the tremor can be plotted. Primary, Secondary and surface waves, and their different trajectories through and round the planet are compiled and compared with data from other countries. We hear the effects of these forces more often on the news, from places that suffer human tragedy from the destruction caused by the planet. That afternoon we learnt that forces effect our planet -not only vibration working from the middle of the planet: from the movement of tectonic plates (making quakes and tremors), but also the geomagnetic forces from round the outside of the ionosphere working in. It was described to me recently that we, on the surface of our planet, are like innocent children or kittens, to whom things happen. In this case vibrations and forces from outside our local view. We noticed the amazing display of Heath Robinson looking gadgets/instruments all over the station. 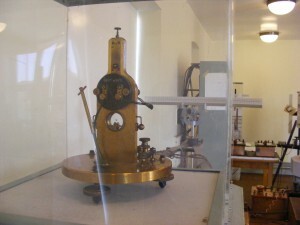 Although we came to see the seismometer, the observation station mainly monitors geomagnetic forces, measuring slight changes in the earth’s magnetic field, and has done for over 100 years (I found a bound record book dated1865). They moved from near Kew Gardens / London in 1957 when the train line was built and started to interfere with the instruments. Records were meticulously kept for posterity, hand drawn in dusty volumes reminding me of nautical maps of uncharted seas. 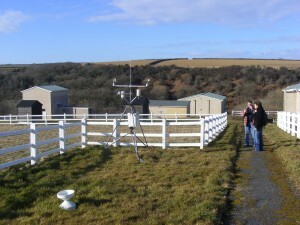 On the head land with the on shore breeze, Steve, the manager who kindly showed us around the Observatory, describes how the latest magnetometer no longer needs a whole building, being small, digital and self heating. I felt inspired to use the geophone we had brought, and was advised by Steve, that a good place to listen to natural sound, was through rock, and the ancient granite rock of the cliffs and harbour wall down the road at Hartland Quay. It turned out we would have heard the sound of the sea, pounding on the ocean floor off Hartland Point, as it added to the natural din of sound in the ground. I never had thought of the sound of the sea emanating INTO the ground before, and even, I fancy, mixing with the earth’s natural low hum, and maybe the sound of more localised quarries and train lines, and low frequency signals from much further a-field, but unfortunately we found we had run out of time to make some good recordings and had to return home, so leaving our recording for another day. hey there and thank you for your information – I’ve definitely picked up anything new from right here. I did however expertise several technical points using this site, as I experienced to reload the site many times previous to I could get it to load correctly. I had been wondering if your web hosting is OK? Not that I’m complaining, but slow loading instances times will sometimes affect your placement in google and can damage your quality score if advertising and marketing with Adwords. Anyway I’m adding this RSS to my e-mail and can look out for a lot more of your respective intriguing content. Ensure that you update this again very soon..
again just for the gorgeous principles you have featured on this website. Lovely article – one of the best things I’ve recently read, and by far the most useful. I am sure there are many people who are faced with the same problems I recently had. I couldn’t find So here is my saving grace: PDFfiller helped me to fill out the NY DTF DTF-5 and and esign them. Just try it http://goo.gl/omh4Ci. you’ll love it. Quite section of content. I simply stumbled upon your weblog and in accession capital to say that I collect in reality enjoyed account your weblog posts. Anyway I will be subscribing on your augment and even I fulfillment you access continually speedy.